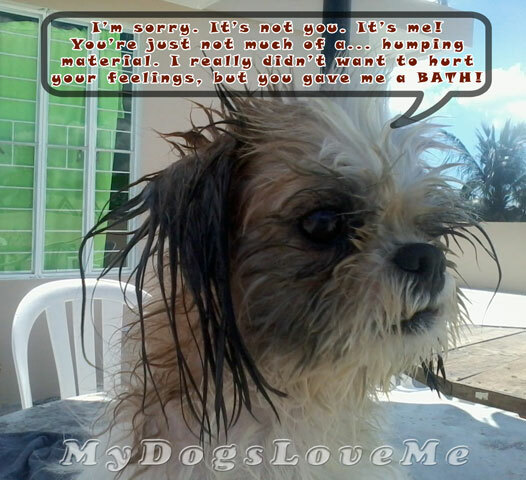 My Dogs Love Me: Wordless Wednesday: It's Not You, It's Me! Wordless Wednesday: It's Not You, It's Me! Have you ever had this feeling that your dog was no longer interested in you? Here's Buchi representing MyDogsLoveMe for the time being. By the way, we got tagged by meowmeowmans. As much as I want to write a new post for the tagging, I am not among my pack so I wouldn't be able to convince/impose/bribe Coal and Ginger to participate. And if you're thinking Buchi sounds like an interesting specimen, it's pretty obvious that he just broke up with me. Meowmeowmans, I hope you could accept the link to my tagged post and re-posting my number 10 answer here for you. 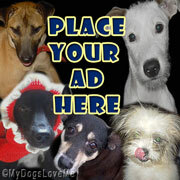 Animal Shelter Volunteer Life is a blog where you can get your fill of adoptable and adorable cats. Looking for a forever cat to love you? This is the blog to visit. Meowmeowmans is one of those bipeds whose heart is set on rescuing kitties and making a difference by putting them into wonderful homes. Ha!ha!ha! Buchi, you look all wet! LOL, BM. You make it sound so awful! yes, i know what you mean. yuki used to be mamas girl and my shadow. my husband went away for two weeks for a business trip and she was never the same with him, meaning she's now his shadow. she gets seperation anxiety when he's gone for even 5 minutes. it's funny because she didn't like him her first two weeks home, she would even take all her toys away from him and put them in a pile next to me so he wouldn't touch them. she's now a daddy's girl. Ahhh, husbands/ partners/ lovers can be great unintentional affection thieves ^_^. Bath times are the worst!!! I agree, both for the mommy and the doggy. But it's definitely the after bathing that becomes a reward. Aww, I love Buchi's unkempt look after his bath - that scrufy look makes dogs even more adorable! Yes, I agree. They look more sexier with the gelled up look. I'm pretty sure he was because after the bath, he went to sleep. Bath time will do it every tim I would not be very happy either! LOL, I can't imagine your mom getting "the stare". That is a classic, "I'm ignoring you now" face! Yes bath time isn't always the best of bonding times....unless a doggie biscuit comes at the end. I agree. Those treats are a must! Poor Buchi! Yes, bath time is certainly NOT fun. Great people deserve great words. I am glad to have you guys in the blogosphere. It just fuels my ambition to do volunteer work. LOL Auggie gave me that look yesterday! It's too bad I'm not staying here for good. How I missed taking care of him which is why I spent so much time pampering him. Sorry you got dumped...at least there are someones waiting at home who love and miss you! Momma understands your busy-ness she is just finishing a project too so you can both catch up soon. (Momma would NEVER be up at 3am working...since I sleep against her side, I would not allow it)! Thanks Siku. Getting dumped is pretty hurtful -.-. I haven't opened of checked out your blogs either because I've been busy with my nieces, and Buchi and Rin (another dog). I can't wait to come home and get back with my regular life. Oh and PS, I've been having so many issues with Blogger, and it's not letting me upload the header you made. Any idea why? I can change it just not to your header. Just wanted to let you know I haven't forgotten about it! LOL, Nola. It doesn't load in the header either. I think that's probably because it's too big. Still, that's alright. I appreciate the fact that you did your best. As for your question on my blog, I've copy a nd pasted my response. Our beards may be clean in the photos, but they are usually stained from mud or just drinking water. Mama has found that giving us bottled water, or filtered water helps with the staining on the beards. They also have little water bottles where you can lick the water out, and that also helps prevent staining. For the staining around the eyes, Angel Eyes can help, and cutting hair away from the eyes so that it doesn't irritate it can also help. Also, make sure that Buchi doesn't eat any grain products in his food, as that can also cause staining. hope that helps. Haha! I think I would have to change it. Had I known Buchi would have some Austin in him, I wouldn't have invested so much love in bathing him. Are baths really that bad? Thats what mom says to us and its a good thing she cant read minds like your mom, bol! I think it's because I'm actually just his Aunt that I am able to perfectly understand Buchi. We've recently reunited! I will be posting new pictures soon ^_^. Hey Buchi, Jet here. Dude, give your human a break! Bathing keeps you healthy and smelling good. Can you make up now? Hey Jet, we absolutely have! I think... He has the squeaky toy I was supposed to bring home for my dogs ^_^.